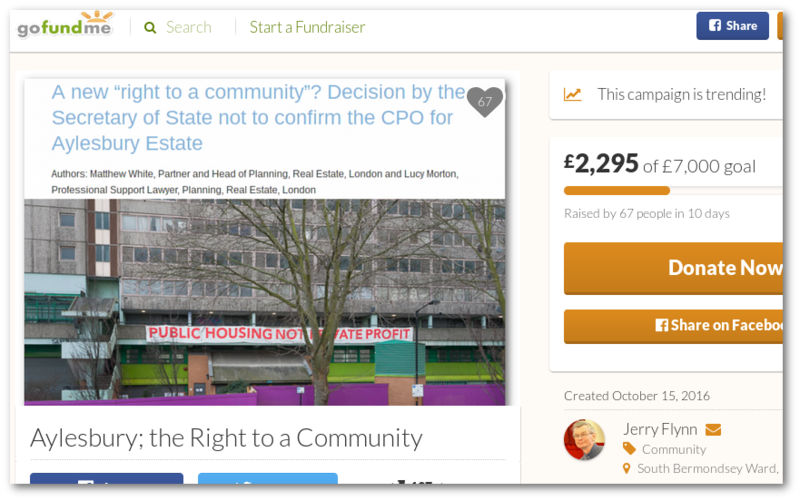 Our crowdfunding campaign to help Aylesbury leaseholders resist Southwark’s attempt to overturn their CPO victory has got off to a great start. We have raised over £2000 in the first week, a testament to the support the leaseholders enjoy. Many thanks to everyone who has donated so far - our target is £7000; we aim to get the leaseholders representation throughout the legal proceedings. In the meantime the leaseholders’ barrister has started work on the case and on submitting a preliminary response to the Council’s grounds of appeal in its letter before claim. On Monday the Secretary of State issued his own detailed response to Southwark’s grounds of appeal, saying that they have ‘no merit’, are all ‘unarguable’ and that the SoS will ‘robustly defend’ its CPO decision and ‘seek his costs of doing so’. Meanwhile, Southwark continues to justify its appeal by claiming that the CPO decision is preventing it from continuing with the regeneration of the estate which will deliver at least 1,260 new ‘affordable’ homes. As we have repeatedly pointed out, however, the new ‘affordable’ homes won’t be affordable to most and the scheme will still result in a net loss of at least 778 social rented homes, so we count any decision that goes towards preventing this as a good one. Southwark has made much of the fact that the Aylesbury estate is being redeveloped by Notting Hill Housing Trust, a ‘non-profit’ housing association. It says much less about Notting Hill’s ‘developer partner’ for the scheme, Barratt Homes. Barratt is the UK’s largest private developer and will be both building and selling all of the redeveloped estate’s 1773 private market homes, with an expected gross worth of £768m. Barratt was in the news last week, when its chief London executive Alastair Baird, was arrested on suspicion of bribery, following an investigation into the awarding of contracts. Barratt has a large number of developments in Southwark and was contracted to build the replacement Canada Water library. Here Mr Baird can be seen alongside Council chiefs at the topping-out ceremony for the new library. More unhappily he also appeared alongside Notting Hill Housing at an angry public meeting on the Bedfont Lakes estate in Feltham, to answer for serious flaws in the estate’s gas boiler system. The Aylesbury regeneration came under fire from footballer Rio Ferdinand this week, who grew up in Southwark on the nearby Friary estate. In an interview with Inside Housing he was highly critical of the impact regeneration was having on communities. He said he has spoken to people, including family members, who had been forced to move to different areas because regeneration work had resulted in schemes that were “not affordable”. He said “The word affordable, I think, is bandied about far too often and isn’t actually true in a lot of cases”. With specific reference to the Aylesbury, he said “Kids from my foundation can’t afford to live there. They grew up on that estate but they can’t live there. It’s not affordable”. In coming blogs we’ll be taking a closer look at Notting Hill Housing’s varying definitions of afforable housing, its deal with Barratt, its wider role in the Aylesbury redevelopment partnership and the growing disquiet about Notting Hill’s conduct elsewhere in the borough.